Research ethics isn’t new but the way we do things at Stirling is…..
Are you aware there is a new ethics process at the university? Looking to enhance the ethics systems and processes in place at the University, a new ethics committee structure has recently been implemented. The new structure further encourages integrity in all aspects of research, from project design through to data storage and publication. Establishing the ambitious cross faculty restructure was challenging and asked a great deal of many people. However, it puts Stirling at the forefront of research ethics and integrity thinking. To help you navigate the new processes, we’ve overhauled the information on the website and created new Research Integrity webpages that bring ethics to the forefront of people’s minds and challenge students and staff alike to think a little deeper about the implications of their research. 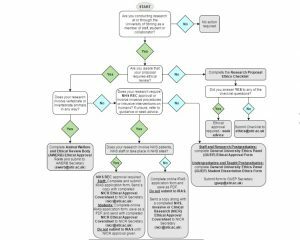 A simple decision tree has been developed to guide you through the process. Some projects undoubtedly have more complex considerations than others, however the core message is that research ethics is for everyone. To gain ethical approval to carry out research everyone must complete the online checklist to ensure that more subtle ethical issues are addressed. Having a clear, rigorous and consistent ethical approval system is essential to good research practice and underpins the University’s drive for excellence. We would like to take this opportunity to recognise the tremendous time and effort colleagues have already and continue to put in. Whilst much remains to be done to refine the system and embed the new processes in practice, there is a definite sense of satisfaction that we are moving in the right direction. REF Manager based in Research and Innovation Services at the University of Stirling.